The City of St. Louis took an important step when it hired the city's first bike/ped coordinator a couple of years ago. 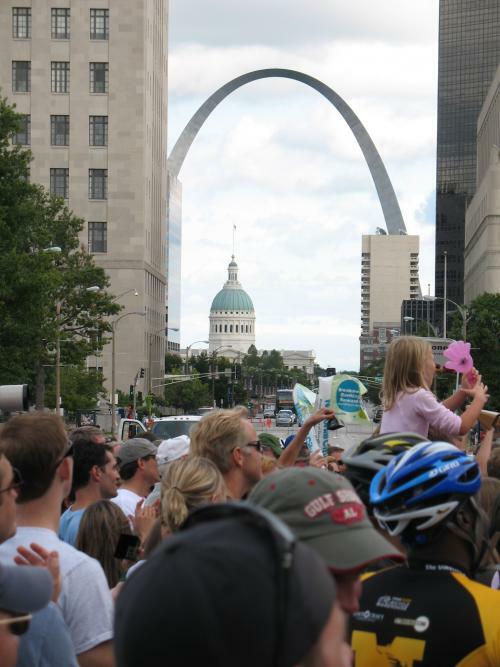 The St. Louis Bicycle/Pedestrian Coordinator Position has been open and unfilled since September 2017--which raises questions about the city's commitment to the position. And getting the right person in the job is just as important as the position itself. In recent weeks, a group of St. Louis City residents, bike advocates, and urban explorers have joined together to lead the effort to ensure St. Louis receives qualified candidates for the vacant Bicycle/Pedestrian Coordinator position and build on the progress made over the past several years. Together, the group has drafted a letter and amended the job description to be sent to Mayor Lyda Krewson and Todd Waelterman, Director of Operations for the City of St. Louis. With the support of several Alderman and local organizations, the group hopes to provide the evidence and support to ensure that the permanent hire is both technically qualified and possesses the needed comprehensive experience. . . . The Bicycle Pedestrian Coordinator position has been instrumental in improving our city’s walk- and bikeability since its creation in 2015. Over 20% of city households do not own a vehicle and rely on numerous methods of transportation to access employment, education, and basic services. Additionally, the City of St. Louis is a designated ‘Focus City’ by the Federal Highway Administration due to a pedestrian fatality rate three times the national average. . . .
We have no doubt the position of Bike/Pedestrian Coordinator requires sufficient experience but are concerned that the current job description may be preventing strong candidates from consideration. This is reminiscent of MoDOT's decision in 2007 to fire its current bike/ped coordinator. At that time, MoDOT made all the right speeches about the need to upgrade the program and improve its effectiveness. But with the benefit of hindsight, it is now clear to everyone involved that the requirement for a traffic engineer to fill the position was simply a ploy to slow down the state's progress on bicycle and pedestrian issues and redirect energy towards addressing detailed technical issues like ADA enforcement while stopping really fundamental visionary change like embracing Complete Streets and Vision Zero. This effort was part of a concerted effort by some top MoDOT leaders at that time to put the brakes on progress in the bicycle and pedestrian arena. Is that situation comparable to the current St. Louis City situation? Only the decision-makers in the city know for sure. But based on our experience with MoDOT, the citizen-led push to update the job description for this important city position to take on a broader and more effective leadership role in this area is very much on the right track. MoDOT's changes to the State Bicycle/Pedestrian Coordinator position in 2007 did indeed lead to progress in important technical issues: Creation of a statewide ADA Transition Plan, review of thousands of MoDOT projects for compliance with ADA and pedestrian standards, significant updates to MoDOT's engineering standards (though far more progress is needed in this area), and technical work towards adoption of on statewide bicycle routes and planning. We do not want to undervalue the important work that MoDOT has done in these areas over the past 10 years. This work is important and needed. How can we work to promote and encourage more walking and bicycling while improving bike/ped safety? What can we do to make the overall transportation system more human-centered, efficient, and effective--in contrast to the typical traffic engineering approach that focuses solely on improving speed and throughput of motor vehicles on the road and highway system. How do all of these initiatives fit into the larger picture of city planning for future growth, economic development, land use, public transit, tourism, turning around the city's population decline, improving livability and making the city a good, healthy place to live for people of all ages, and building places that combine livability, industry, and economic growth. The type of person who can effectively move forward with this type of work understands the technical issues but is also able to effectively communicate with the public and agency staff. Most important of all, this person has the vision and skills to help set and implement broad changes to the direction city policy and funding based on big-picture vision and fundamental principles of city planning and design, not just technical requirements for road, trail, or crosswalk construction. In this position, citizens are not just asking for someone who is expert in the technical standards for crosswalk design. St. Louis needs someone in this position with a much broader vision and the tools to make it reality. We encourage the city, elected officials and staff, local organizations, and interested citizens to move forward together design the right position, find the right person, and to fill this very important job opening as soon as possible.